Completion of an effluent reuse strategy with MEDLI modelling to identify reuse areas, rates and water quality. An Oxidation Ditch Process was initially selected as the preferred process during the treatment plant options assessment task. We reviewed a large range of options including intermittent, compartmentalised activated sludge, MBR and wetland processes. These processes were closely process modelled to determine design parameters that would enable a first principles capital and whole of life cost estimate to be undertaken. This was fed into a multi-criteria assessment of the options considering treatment technology, sludge handling implications, effluent quality, GHG emissions, flood impacts and O&M aspects. We also undertook an extensive effluent reuse investigation of current and potential sites. The review involved Medli modelling based on expected water quality from the new process. The review recommended a strategy where two process trains were developed to produce Class B quality for pasture irrigation and Class A for golf Course and sporting field irrigation. Extensive work went into ensuring there were the necessary log credits for Class A irrigation based on reuse site risk assessments. After the completion of the treatment plant options assessment Craig White (Lead Process Engineer) undertook a study tour of a new emerging technology known as granular activated sludge (an RHDHV technology known as Nereda). The process claimed power and capital savings over the current flocculent activated sludge processes used worldwide. The study tour involved a literature review and visiting an operating 60,000 EP plant in the Netherlands. The tour showed the technology had promise and was performing reliably. Since this time many other plants have been built worldwide and are performing well. We presented the results of this study tour to our client and they decided to allow for its potential consideration by changing the project to a Design and Construct (D&C) delivery model. We developed their preferred traditional design (the oxidation ditch) to a concept stage. We procured tenderers for the preferred oxidation ditch, however considered offers for pre-registered alternatives, which enabled a robust assessment of a potential new technology against a tried and tested activated sludge option in a commercial environment. Our team transitioned into Council’s technical adviser “Owners Engineer” during the tender assessment and as technical reviewer during the design and construction phases. After an extensive tender assessment process, the granular activated sludge process was selected as it offered both capital and O&M cost savings. The plant has been constructed and commissioned in 2016. South Burnett Regional Council and Hunter H2O has since been awarded an excellence award for projects over $10M at the 2016 IPWEAQ Excellence Awards as well as the QLD AWA Excellence Award in 2017. 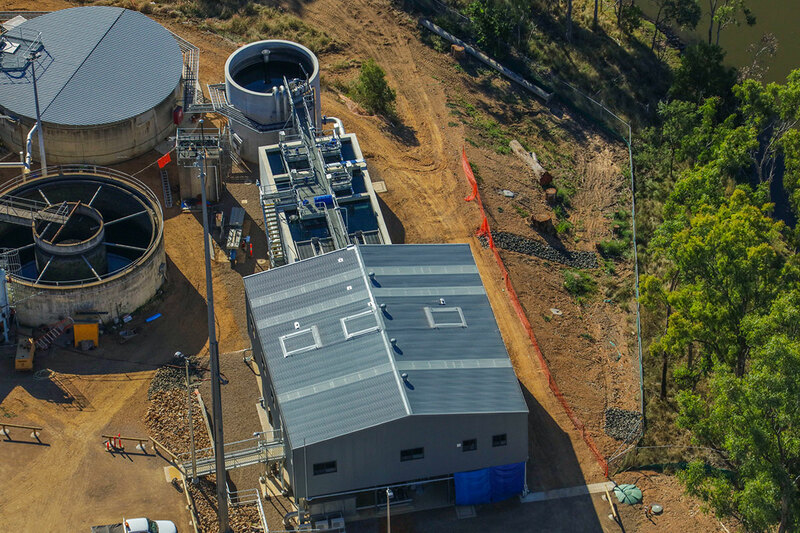 Hunter H2O is currently assisting council with the optimisation of the plant and the recycled water facilities. This project is a good example where Hunter H2O worked with our client to produce an outstanding outcome. Our commitment to our clients meant we were happy to forgo substantial detailed design fees (previously awarded) to pursue a better whole of life cost outcome for our client whilst working alongside them to manage the risks of a new technology.